Black is the original chic color. You can still add color to your store, without going too bold. 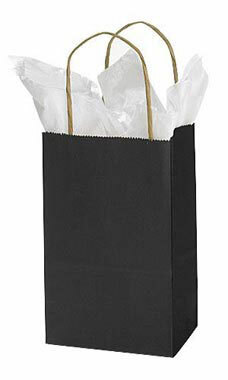 These black shopping bags feature handles and a gusset and are more tear resistant, providing durability, convenience, and simple storage options. Sold in cases of 100. We also offer custom paper bags where you can add your logo, messaging and more. Check out all of our Custom Creations to build a comprehensive look that will make your store stand out from the competition!